The Around Long Island Regatta, a 190-nautical mile circumnavigation of Long Island hosted by Sea Cliff Yacht Club in Sea Cliff, NY, has become an annual tradition for Oakcliff Sailing in Oyster Bay, NY. This year, Oakcliff decided to make racing more captivating by match racing two Farr 40s, Oakcliff Racing (equipped with a steering wheel) and Oakcliff Sailing (a tiller boat), to add some friendly competition between the Oakcliff athletes. For our Offshore Acorns, the Around Long Island Regatta was their first offshore racing event of the summer. With the help of the more experienced Saplings, supporters, and coaches, the Acorns learned firsthand what offshore racing is all about. “I became an Adult Offshore Acorn because I wanted to learn more about sailing larger boats,” said Anne Corvi, a member of Oakcliff Racing, the wheel boat team. Corvi has been an active participant in Oakcliff’s match racing circuit with her all-female team and is also a full-time architect. Prior to the start of the race, Corvi and the other Acorns and Saplings participated in the preparation of each Farr 40. For the Acorns and Saplings, this is an essential part of the Oakcliff program because it helps them learn how to properly manage a boat. Each sailor helped with boat repairs, loading sails and materials, provisioning and more before the boats could be delivered to Sea Cliff. Soon after, the teams arrived at the starting area, and all of the team members were in race mode and ready to go. The boat captains and coaches made their last comments, and everyone began concentrating on their respective duties. When the race began, Oakcliff Racing was dueling with the U.S. Naval Academy’s Farr 40, Ranger, off of the starting line while Oakcliff Sailing was trying to catch up after a time-consuming circle. Each team focused on sailing with proper trim and staying on course as they headed East towards Montauk. During the race, both teams saw their reasonable share of puffs and lulls on Saturday. Each team had faced little breeze around Montauk, and they tried to stay away from shore to avoid the adverse current. After rounding Montauk, Oakcliff Racing caught up to Ranger, who sailed off earlier, because Ranger had chosen to sail inshore where there was more breeze but an adverse current. Later that evening, teams saw minimal breeze around Port Jefferson where they drifted towards the finish until the breeze picked up again that night. Both teams were able to finish around 10 pm that night. Each team made a quick pit stop at Sea Cliff Yacht Club before delivering back to Oyster Bay. Unlike any other sailing program, Oakcliff Sailing provides sailors with a coaching and training center that will take them to the next level with their unique education style. Oakcliff helps provide athletes with a diverse skillset from that cannot be received from any one institution. As a US Sailing Team Sperry Top-Sider Training Center, Oakcliff helps provide support for future Olympians and sailing industry professionals through inshore, offshore, and high performance training. Oakcliff’s two signature programs, Acorn and Sapling, attract sailors from all over the world. The Acorn program for ages 15 and up, and comprises three different sessions: Inshore, Offshore, and High Performance. This allows young adults to get a taste of each type of racing. On the other hand, the Saplings are fully immersed in the Oakcliff culture, and they get to experience the best inshore and offshore racing the East Coast has to offer. 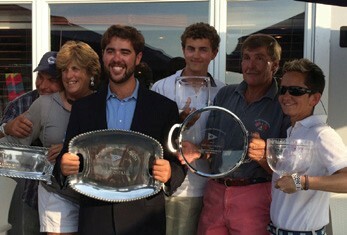 Earlier this year, the Saplings participated in the Block Island Race, the Newport Bermuda Race, and several match racing regattas. Oakcliff’s next offshore adventure was the Ida Lewis Distance Race, which started August 15 in Newport, RI. The team raced Oakcliff’s Farr 47 in the Youth Challenge division, and finished 8th in a very competitive PHRF Division. For more information about Oakcliff Sailing and their programs, please visit oakcliffsailing.org.